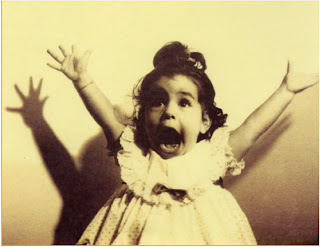 Some good news to share with my readers--I am finally making a transition from "aspiring children's librarian" to actual children's librarian! I have been offered a full-time position as a children's librarian with one of the largest public library systems in the US. I will be starting in a few weeks at a branch in a suburb of Los Angeles about 20 miles from my home. I feel very lucky to get this job, since the job market for librarians, particularly here in California, remains very tight. I am planning to keep blogging about historial fiction and children's nonfiction here at the Fourth Musketeer, and Lisa at Shelf-Employed and I are already thinking about Year 3 of Kidlit Celebrates Women's History Month, so stay tuned! Recommended for ages 12 through adult. In a stunning work of nonfiction for young people, award-winning author Doreen Rappaport has just published an ambitious new work profiling little-known true stories of Jewish resistance during the Holocaust, a book that took her six years to research and write. Her extensive research for this project included interviews with some of the survivors whose stories are told in this volume. This is a massive topic for a book for young people, but Rappaport manages to make it comprehensible by dividing her story into discrete sections and concentrating on a selection of individual stories. The first section, titled Realization, deals with the years up until the beginning of the war, when Hitler came to power. The second, Saving the Future, discusses brave Jews who smuggled Jewish children to safety in Holland, Belgium, France, and the forests of the Soviet Union. In part three, Rappaport examines resistance stories from the ghettos, not only the famed Warsaw ghetto uprising, in which a few thousand Jewish fighters held off the might of the Nazi army for nearly a month, but organized escapes from the Vilna ghetto and secret magazines penned by children in Theresienstadt. Other chapters discuss resistance in the concentration camps and partisan warfare conducted by Jewish resistance fighters against the Nazis. As Rappaport notes in her introduction, few of these remarkable and heroic stories are known to the general public. Even in Jewish families, we generally learn that Jews went to the gas chambers like "lambs to the slaughter." In this volume, she takes pride in showing that stereotype is untrue, and that there were many Jews who defied and resisted the Nazis in a variety of ways. These many amazing stories include that of 14-year old Idel, who escaped not once but twice from a labor camp in Belorussia, finally succeeding in tunneling out of the camp with the help of other inmates, after which he reaches the partisan Jewish group governed by the Bielskis, who were hiding out in the forest. Rappaport even includes an incredible story of a revolt of the Sonderkommandos, the Jewish prisoners who were forced to work in the gas chambers and the crematoriums. Although their elaborately planned revolt ultimately failed, they did succeed in blowing up one crematorium. Handsomely designed and abundantly illustrated with dozens of archival photographs and maps, both from the war years and after, the book is supplemented with extra material on Rappaport's website, including conversations between the author and some of the survivors she profiles and links to other resources for studying the Holocaust. Extensive back matter includes: a pronunciation guide for the many foreign names and words in the text; a timeline of important dates from 1933 when Hitler takes power until the end of the war in 1945; source notes; a selected bibliography of books and websites, organized both as an overview and also chapter by chapter; photography and art credits; and an index. 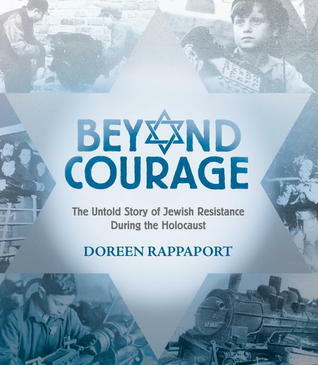 A study guide for Beyond Courage will soon be available on Rappaport's website. This book is highly informative and readable for adults as well as students, and definitely belongs in all public and school libraries (at least high school and middle school). I will be incredibly surprised if we don't see this book--a model of outstanding nonfiction writing for young people--recognized during book award season. Author-illustrator Marissa Moss has two excellent new historical fiction novels for young people out this fall: Mira's Diary: Lost in Paris and A Soldier's Secret. Today I will be reviewing the first of these, and a review of the Civil War historical thriller A Soldier's Secret will be coming next week in my blog. 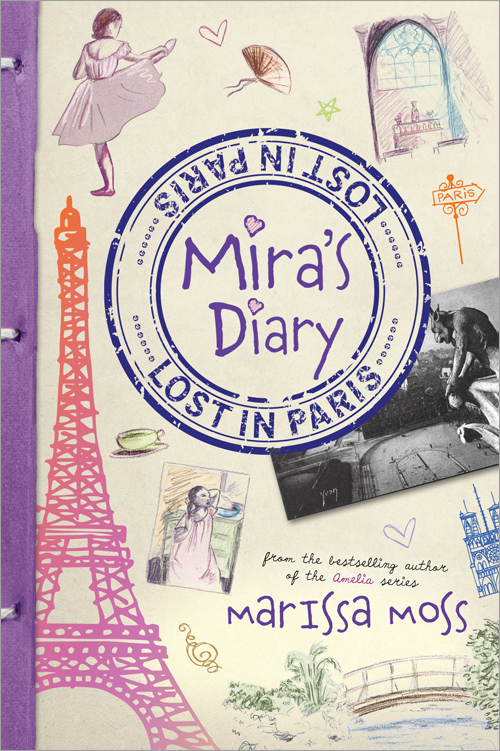 In Mira's Diary, Moss creates a time travel story melding the exciting artistic world of 19th century Paris with the shocking political intrigue and anti-Semitism of the infamous Dreyfus affair. Although the Dreyfus affair is well known to those interested in French history, it's certainly not a topic most young people in the U.S. will be at all familiar with, and I applaud Moss for choosing to set her story around this important tale of corruption and scapegoats. Our story begins when young Mira receives a strange postcard of a gargoyle from Notre Dame in Paris from her mother, who has been missing without any explanation for many months. Not only is the black and white postcard very old-fashioned looking, so is the faded French stamp. And "who sends postcards anymore?," wonders Mira. With the postcard their only clue, Mira, her father, and her 16-year old brother take off to Paris, hoping to find her mother. They check into a quaint hotel in the Marais, Paris' historic Jewish quarter, before going off to explore the famous cathedral. Mira can't help looking everywhere for her mother, but it's not until she touches a gargoyle on the top gallery of the cathedral that she realizes she's been looking in the wrong century! Magically transported to April, 1881, Mira not only befriends a good-looking young man who turns out to be an assistant to the famous French artist Degas, she also finds herself embroiled in the Dreyfus affair, a political scandal that involved the French army and virulent anti-Semitism in the French military and society at large. Mira spots her mother several times, and receives several mysterious and secret notes from her. It's clear that her mother is in danger, and Mira must step up to try to keep Dreyfus, a Jewish army officer, from being unjustly punished as a traitor. This novel manages to mix very serious topics such as prejudice and anti-Semitism with an up-close look at late 19th century Parisian artistic life, letting us visit Giverny, Montmartre, the Impressionists Exhibition, and Parisian salons populated by famous artists such as Degas, Monet, Seurat, and Mary Cassatt. Moss even throws in a hint of romance between Mira and Degas' handsome young assistant Claude. Although readers will learn a lot about history and art through this book, they will also be entertained by the suspenseful story featuring a likable heroine who finds herself in a difficult--and certainly unusual--situation. In the manner of her Amelia's Notebook series and her historical journals, Moss gives this new book the feel of a real journal or diary, from the cover with its mock journal binding to the charming small pencil sketches distributed liberally throughout the novel and the endpapers decorated with Mira's notes to herself, a map of France, and French vocabulary. An extensive author's note provides a detailed explanation of the complexities of the Dreyfus affair (geared for tween readers) and the military corruption and anti-Semitism it exposed in 19th century Paris. Moss also provides brief notes on Paris in the late 19th century, the impressionist art movement, and author Emile Zola, who wrote the famous "J'accuse" newspaper article in favor of Dreyfus. 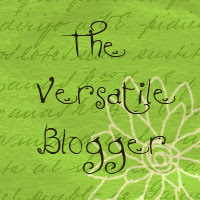 A bibliography lists other resources and books consulted by the author. There are so many books about Harry Houdini for young people. 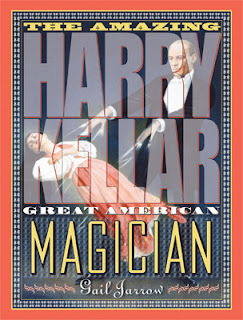 I was delighted to discover this new, immensely readable and attractive biography of a contemporary of Houdini's, Harry Keller, equally or even more famous during his lifetime than Houdini but known these days only by insiders in the magic community. Jarrow traces Kellar's life and career, which spanned half a century and five continents. After running away from home at the tender age of 10, he winds up living with a minister who wants to educate him to become a preacher. After attending his first magic show, however, Harry wanted nothing more than to go on the stage himself, and managed to get himself a job as a magician's assistant. His magic career took him all around the world, traveling by ship, train, stagecoach, or even on the back of a mule. Renowned for his elaborate illusions, variants of which are still performed today in Las Vegas magic extravaganzas, Harry never rested on his laurels, but was always looking for new and even more amazing illusions for his shows. Many of these fascinating illusions are described and pictured in this biography. Special kudos go to the designer of this large format, full-color book, which incorporates many of Kellar's original posters, as well as fonts in the text that echo the look of the antique posters. Kellar's posters often featured him with devils and imps, thought to be the source of the magician's incredible powers. The book features many contemporary photographs as well as sidebars about diverse topics touched on in the text, such as magic history, spiritualism, and entertainment in Kellar's time. Back matter includes a timeline, source notes, a comprehensive bibliography, an index, and a list of resources such as websites, magician organizations, and DVD's. Of course, this book is a sure winner for kids--and even adults--interested in magic and the history of the theatre in general. But its appeal should be much broader. It's a terrific book for leisure reading for young people who prefer nonfiction, and also provides plenty of facts for school biography reports. 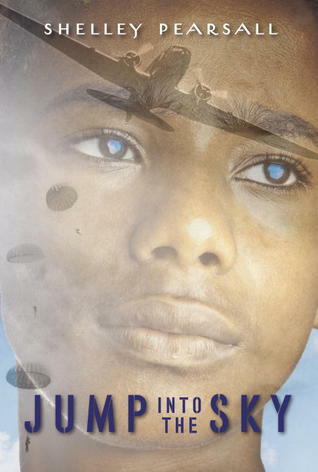 In her new historical novel Jump into the Sky, award-winning historical fiction author Shelley Pearsall explores a little known footnote in World War II history--the 555th Parachute Infantry Battalion, the first black paratrooper unit in the U.S. Army. The story of the 555th unfolds through the eyes of thirteen-year old Levi, who's been living with his aunt in Chicago while his father serves in a secret Army mission. It's May, 1945, and the war is drawing to close. Levi's aunt decides to send him off by train to stay with his father at his dad's last known address, an army post in North Carolina. Not only does his father not know he's coming, Levi arrives in the Jim Crow South without a clue as to the behavior expected of a "colored boy" and almost gets himself killed for trying to buy a Coke at the wrong store. And to make things more difficult, his father's unit has been sent all the way to Oregon. Will Levi have to go back to his aunt, who doesn't want him any more, or will he be able to find his father in Oregon? And will his father survive the dangerous mission assigned to the 555? This novel is a powerful story of racism and courage in the not-too-distant days of the Jim Crow South and a segregated American military. Although the main characters of Levi and his father are fictitious, the novel is carefully researched and many of the incidents described really happened, including the scene at the country store with the Coca Cola. Moreover, the novel is peppered with colorful real soldiers from the 555th, including "Tiger Ted" Lowry, who once fought Joe Louis in an exhibition match. An author's note describes how she first learned of this battalion, which was part of a secret operation to protect the U.S. from Japanese balloon bombs. This balloon bombing strategy of the Japanese is certainly a "truth is stranger than fiction" story. Pearsall was fortunate to interview a veteran of the unit, Walter Morris. Further details on the 555th can be found at the unit's website, triplenickle.com. I would highly recommend this book to middle schoolers looking for a good adventure story that brings a little known part of World War II history to life. The two most famous works by Charlotte and Emily Bronte--Jane Eyre and Wuthering Heights--are classics of English literature, and have been frequently adapted for the movies and television as well. But the lives of their authors, and of their sister, Anne, author of Agnes Grey, are perhaps not as well known, especially to young readers. Author Catherine Reef, who published the very well-reviewed biography for young people Jane Austen: A Life Revealed, in 2011, has turned her attention to the tragic lives of the Brontes in her newest work. 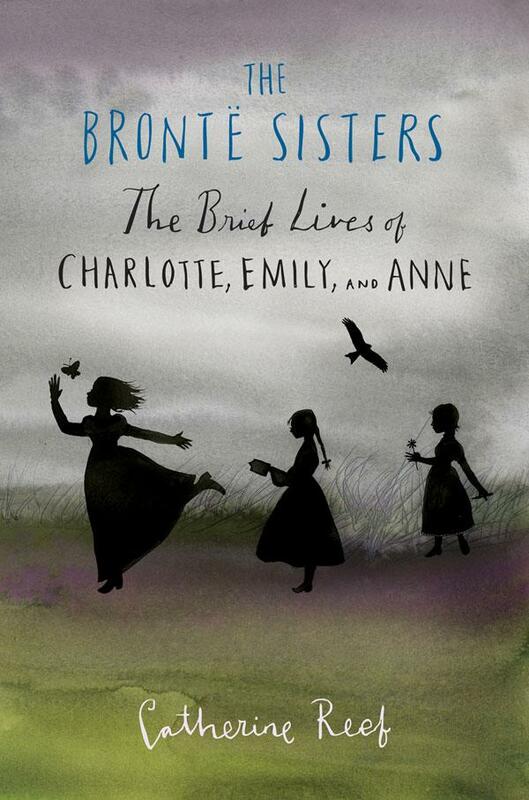 Reef's writing style is easy to read, with a narrative flair that makes the Brontes lives read much like a novel. The biography opens when their father, Patrick, a country minister, was left to raise six small children when his wife died soon after the birth of their youngest, Anne. Although he hoped to marry again, and proposed to several women, "none wanted a husband with a small income and a large family." The children grew up in the wilds of Northern England, exploring the moors. Because the children had only themselves for playmates, they developed an elaborate fantasy universe, complete with imaginary lands acted out by a set of toy soldiers. The 19th century had few options for "respectable" women, and with no dowries for his daughters, Patrick Bronte sent his daughters to train to be teachers so they could provide for themselves after his death (ironically he outlived all six of his children). When the two eldest die of tuberculosis, caught at the horrible school they attended, the surviving girls and their brother Branwell were educated at home, where they studied the classics as well as contemporary 19th century Romantic poets like Byron and Wordsworth. All of the Bronte siblings were deeply creative, from Branwell, an artist who was ruined by drink and opium addiction, to the women, who were all talented writers. However, women were not meant to be authors in the 19th century, and all were forced to publish their works under male pseudonyms. 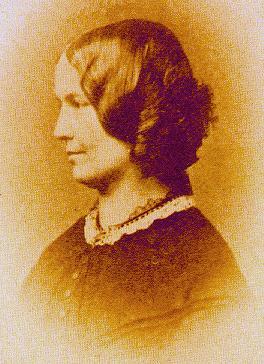 Charlotte, under the name Currer Bell, was the first to be published, with Jane Eyre, in 1847. In the course of this group biography, Reef provides summaries of the Brontes' major novels, including the lesser-known Agnes Grey as well as analysis of their novels' themes, historical importance, and current interpretations. She also situates the novels in the context of women's history, stating that Charlotte Bronte "had written frankly about a women's feelings at a depth no other writer had yet explored." Reef also writes especially movingly about the terrible year of 1849, in which Branwell, Emily, and Anne all die in eight months, leaving their sister Charlotte as the only survivor of the original six children. She, too, was destined to meet an early and tragic death; not long after getting married, and finally knowing a brief period of happiness, she too, died, at the age of 38. This well researched book is abundantly illustrated with photographs, portraits, and illustrations from the Brontes' novels. Back matter includes a detailed bibliography, end notes, and index, and a list of the works of Charlotte, Emily, and Anne Bronte, including references to published editions of their letters and their childhood writings. The brief length (190 pages) and accessible style of this biography make it eminently suitable for school and public libraries, where it could be a useful resource for school reports. Although the length means that readers don't get an in-depth portrait of any of the Brontes, the book is a well done introduction that may spark further reading among young readers. Readers, what is your favorite adaptation of a Bronte novel? Leave a comment below. 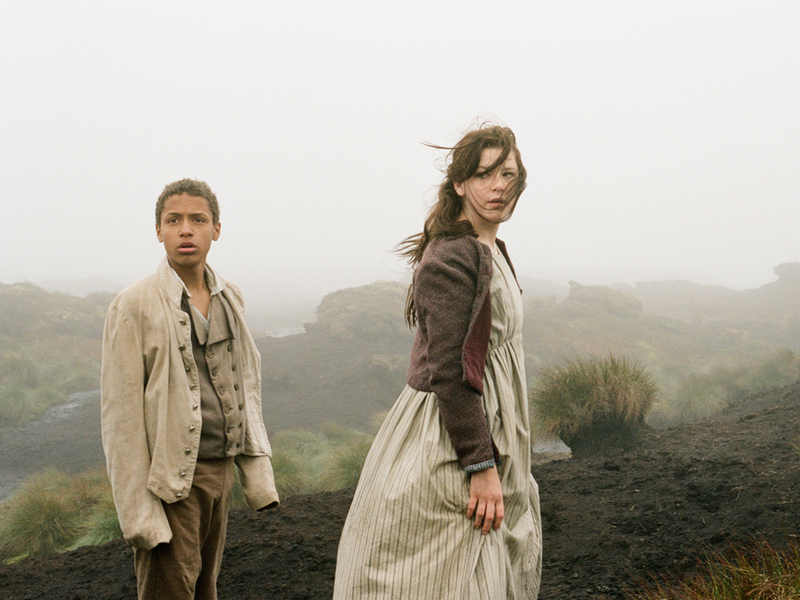 Wuthering Heights alone has been adapted more than 30 times for film, TV, radio, and even opera. My favorite adaptation is the Jane Eyre miniseries done for Masterpiece Theatre in 2006, starring Ruth Wilson and Toby Stephens. Much better than the 2011 movie, which had to leave so much out! Check it out on DVD from Netflix or your local library. And watch for a new version of Wuthering Heights to be released this fall, the first time Heathcliff is depicted by a black actor. I can't wait to see that one! 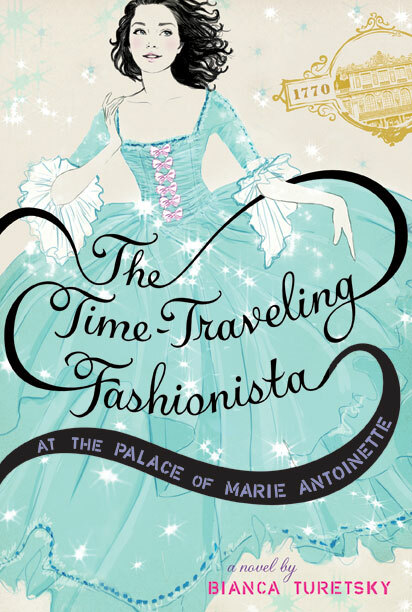 In the second in her series about a fashion-obsessed middle-schooler who time travels by trying on vintage clothing, Bianca Turetsky turns to the court of Marie Antoinette, who was truly a fashionista before the word was coined. Louise, our heroine, is once again invited to a vintage sale by the Traveling Fashionista, the same store she visited when she mysteriously time-travelled to the Titanic's maiden--and only--voyage. Louise's father, an attorney, has recently lost her job, and now Louise can't go on her French class trip to Paris. But no worries--Louise is about to have a much more exciting adventure than a class trip. When Louise visits Marla and Glenda's mysterious vintage shop, which is located on a street that doesn't appear on any maps, she tries on a delicate blue satin ball gown, a genuine Rose Bertin. Although the designer's name means nothing to Louise, Rose Bertin was dressmaker to Marie Antoinette, and as soon as Louise tries on the gown, she is magically transported to Versailles. There she becomes Gabrielle, the Duchesse de Polignac, and the dear friend of a pretty blonde teenager that Louise soon figures out is the doomed Marie Antoinette. Can Louise open Marie Antoinette's eyes to the suffering of the French people, and maybe save her life in the bargain? And will she be able to get back to the 21st century in her magic dress? 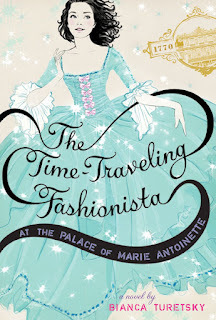 I loved the premise of this book, since my #1 time-travel destination would be to the court of Marie Antoinette, but I could not help but be disappointed in many aspects of the execution. Marie Antoinette was indeed the "Queen of Fashion" (see the excellent biography by historian Caroline Weber, Queen of Fashion: What Marie Antoinette wore to the Revolution), and in that sense a trip to her court is a perfect match for this fashionista series. But I was troubled how Turetsky plays fast and loose with historical timetables, which bothers me in historical fiction, particularly for kids, where they might not know the historical facts. For example, although no date is given, Louise remarks that Marie Antoinette is not much older than she is, so we can assume it takes place around 1770 --the year she marries the heir to the French throne, Louise-Auguste. Turetsky repeatedly refers to Marie Antoinette's husband as Louis XVI, although he didn't take on that title until the death of his grandfather, Louise XV, in 1774. She also has Louise turn into the Duchesse de Polignac, a very close friend of Marie Antoinette, but one whom she didn't even meet until 1775. Also, Marie Antoinette is depicted as being unpopular with the French people, a development that happened much later in her reign. And when they visit Marie Antoinette's dressmaker, they come home with boxes full of clothes, which were all made to order in those days. Perhaps some of these details are cleared up by the author in a "Historical References" section, which did not appear in my advance copy, but I think if the author wanted to include some of these characters and events that take place closer to the French Revolution, she ought to have set the story a bit later, to keep the historical timeline more accurate, even if that would have made Louise and Marie Antoinette not quite so close in age. An element of the book that I very much admired are the abundant fashion illustrations, done by fashion illustrator Sandra Suy. They will be in full-color in the final version, although I had to make do with black and white in my advance copy. The style reminded me very much of the vintage Barbie illustrations from the late 1950's and early 1960's, and fit very well with the Rococo style of the 18th century clothes. Despite my criticism of the historical misrepresentations in this book, I do think that tween girls will enjoy this time travel adventure. For those tweens who want to learn more about the endlessly fascinating Marie Antoinette, I would recommend the recent book by Carolyn Meyer, The Bad Queen: Rules and Instructions for Marie Antoinette, a perfect match for that age group. 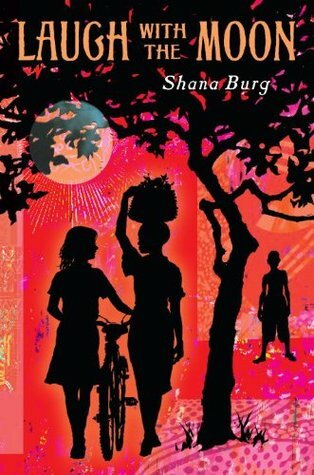 Having recently returned from my first trip to Africa, I was eager to read this new novel by author Shana Burg which takes place in Malawi. Thirteen-year old Clare has just suffered one of the worst losses a child can imagine--her mother has died, leaving her family consisting of just her and her father, a doctor who seems to care about everyone else more than Clare. At least that's the way she feels when he up and moves the two of them to rural Malawi for several months, where he will be working at the local hospital and she will attend the local village school. But this novel is more than a "fish out of water" story as Clare struggles to adapt to a completely foreign environment and lifestyle, where she has no cell phone coverage, must wear a totally unfashionable school uniform, and live literally in the middle of the jungle, with no condos, buses, or restaurants. She's so angry with her dad that she's giving him the silent treatment. But eventually the people of Malawi break through her broken heart, helping her to heal. Burg, who has worked in Malawi herself with Save the Children, does a terrific job capturing the many wonders of Africa--the spirit of the people, the beauties of the landscape and animals, and the crushing poverty. Young girls will identify with Clare trying to fit in with the local girls--gossiping about boys and who likes whom seems to be a universally popular occupation--as well as her sorrows and achievements during her trip. And they'll be amazed at how the children in the local school manage with hardly any textbooks (which must be taken for safekeeping from school every day so they won't be stolen), paper, desks, or other ordinary school supplies that we take for granted, even sculpting letters out of termite mounds. Clare, like everyone else who visits Africa, I suspect, is the not the same person when she leaves. This novel manages to combine humor (naughty monkeys and pet chickens, in particular) with the poignancy of loss in a way which is appealing to the target audience. Burg also manages to teach many lessons about Africa in a subtle manner, without seeming didactic. An author's note explains about the author's trip to Africa to investigate conditions in schools in Malawi and also discusses the challenges of medical care in this very poor country. She also includes a recipe for a Malawi treat and a glossary of Chichewa words that appear in the text. I would have liked to see a map of Africa which would have situated Malawi for the young readers, and possibly a list of nonprofits that accept contributions for medical or school projects, in the case that young people are inspired to help out for these very worthy causes as part of the back matter. This would be a great book to add to school and public library collections--it's a contemporary story in an exotic setting that should definitely appeal to tween readers.